This week because our daughter had a day of school for teacher training, we decided to go out for the day, I had originally planned to go to the space centre in Nottingham as we had a ticket for there and two other attractions (which we had been to) that needed to be used before the end of the year, but silly me didn’t check the opening days on the website, so when we got there the attraction was closed, so a quick look at the map and we seen the Tropical Birdland which wasn’t that far away so decided to go there, and really glad we did. Tropical Birdland is located in a small village in Leicestershire called Desford, if you don’t know the area, would be best to use satnav to get there. Prices are £7.25 for Adults, £4.95 Children. For full opening hours and upto date pricing see the official website HERE. The attraction is set in 6.5 acres which has over 250 birds to see, there is also a restaurant, woodland walk and a children’s play area. When we got there we was bit confused as you walk pass the restaurant then go straight through down a walkway going pass some aviary’s with owls and other birds, and we wasn’t to sure where to pay until we walked around the corner to a window where you can pay. You then see in front of you loads of different aviary’s. One of which you can walk through getting up close to some of the water birds. There is also a woodland walk, we didn’t go round this as was bit cold the day we went. There are various birds you can see here are just a few, Macaw’s including Blue & Gold, Green-Winged, Hyacinth, Cockatoo’s inc Galah, Citron, Bare-eyed, Kea Parrots, Snowy Owls, African Greys, Black-headed Caique, this is just a few, now I don’t really know all the names of the different birds, all I know is that they are beautiful to look at. There are also two emu ‘s aswell. 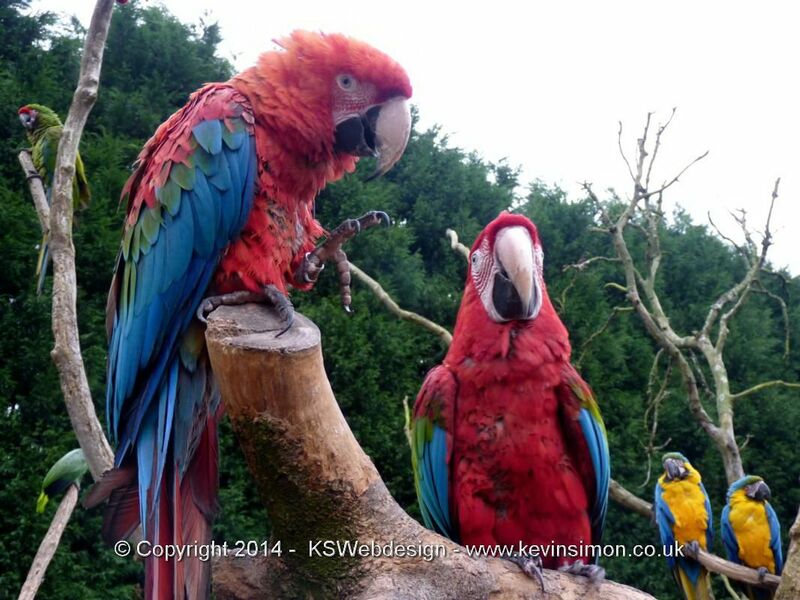 Most of the birds are in caged aviaries, but the great part is Parratt walk where you can get up close to different birds including parrots, Macaws etc. The birds will even get on your arms and even your head, which is great fun, though some children may get a little scared of this, though if you do need help the staff are great and willing to help. The one young lady that we seen on our visit, I cant remember her name, but she had been working there for 6 years and was very informative and knowledgeable about all the birds. Though be a bit careful as some of the birds do like to nibble buttons and do like jewellery, we had one bird take a button of one of our coats and another chewing a zip, they can nip you aswell, This may sound bad but it really isn’t as it is great to enjoy the birds up close. There is a children’s play area as well as outdoor seating, also a indoor restaurant serving food and drinks and on our visit this was very welcoming having a nice hot drink on a cold day. Unfortunately the day we went is was a pretty cold day but we did spend nearly two hours looking at the various birds. It is defiantly a place we will visit again, when the weather is bit warmer as you could easily spend the whole day there. Below are some of the photos I took, to be honest not fully happy with the photos as was bit of a overcast day so the photos don’t do the colours of some of the birds justice. Well I hope you find this review of the Tropical birdland of use, you can keep upto date with photos and info on the birds through there Facebook page HERE. We toughly enjoyed our visit to the Tropical Birdland, our daughter was bit unsure of going as she thought it would be boring, but she did really enjoy it, aswell as the adults, all in all a great place to visit. As there is so many birds to see that really I haven’t gone into in this quick review. So really something for everyone to see.